Pottermore: Questions from the Sorting Hat… | Expecto Patronum! So… now that Pottermore is open to all, I can show off my Sorting Quiz without Spoiler Tags! 1) Given a choice between The Wise, the Bold, the Good, the Great, I chose The Wise. 2) Given a choice between several different scenes in an enchanted garden, I was most attracted to a luminous pool. 1st – the ancient book of runes thought to belong to Merlin (and yes, I would have given that same answer even if Merlin were a Hufflepuff!). 2nd – the Headmaster’s nearly-perfected Dragon Pox cure. 3rd – one-thousand years’ worth of Hogwarts student records. 4) Given a choice of different supernatural creatures, the one I was most likely to want to study was merpeople. 5) Given a choice of roads, I would have chosen the narrow, dark alley lit by lanterns. 6) Given a choice of dusk or dawn, I would choose dusk. 7) Given a choice of left or right, I would choose left. 4) Same question. My husband chose centaurs. 5) Given a choice of nightmares, my husband chose heights. 6) Given a choice of Forest or River, my husband chose river. 7) Given a choice of Heads or Tails, my husband chose tails. Question 1: “The Wise” is the answer I would have given 100% of the time. I suspect the same is true of my husband. Question 2: I don’t know the rationale behind my husband’s choice in the Enchanted Garden, but I picked the luminous pool primarily based on aesthetics. I love the interplay of light and water. Question 3: My husband and I both love Merlin and old books, so I suspect this is behind both our responses on what to save first with a troll on the loose. I personally figured that the Headmaster could concoct his Dragon Pox cure again based on what he remembered from the previous concoction, but something as priceless as Merlin’s book could never be replaced. However, even though the geek in me would have found it fascinating to go through the thousand years of student records and see what sorts of patterns and trends emerged – and how many detentions famous Wizards and Witches received – I would have felt guilty about placing the student records ahead of the Dragon Pox potion. So I thought it would be best to save the Dragon Pox potion before the student records… even though the student records would be more interesting to sort through. Dragon Pox “for the greater good.” LOL. Anyway, that’s the rationale behind my answer. Question 4: Magical creatures was the toughest question for me, but it doesn’t seem to have caused my husband any hesitation. He chose centaurs because he considers himself a Sagittarius. Me, I tried to answer the question rigorously from within the Potterverse. :) Consequently, I quickly eliminated ghosts and centaurs. Ghosts aren’t scary in the Potterverse. They’re just kind of comical. And while I love the centaurs of myth, I don’t much like the centaurs of the Forbidden Forest. As for vampires and werewolves… I eliminated them because they have fairly strong House associations, and I already know so much about them. Merpeople, on the other hand, are fascinating within the Potterverse. They’re fierce – yet intelligent, mysterious, and musical. I could definitely see myself conducting a deeper study of merpeople. Question 5: After answering question 4 differently, my husband and I were put on different tracks for the remaining questions. However, I suspect that he would also have chosen the dark, lamplit alley that I did if he had been given a choice of four roads. We both love classic, atmospheric horror movies. And that’s what prompted my response. I also would have loved the forest path I could have chosen, but the woods are three doors down from my house, so I can walk in the forest pretty much any time weather permits. (ETA: He says he may have chosen the forest path). As for nightmares… I probably would have chosen the eye looking through the keyhole in the door. But I could easily have gone with heights… and probably would have debated the two possibilities in my head rather extensively. Question 7: No question. I would choose left every time. I suspect my husband would too, given that he is left handed. As for Heads/Tails… I would have chosen Heads. So… does anybody have any thoughts on which elements of these Quizzes gave my husband Ravenclaw and me Slytherin? We obviously have a lot of similarities. I have a lot of thoughts on what put us into our respective Houses (and “random selection” is not among them! ), but this post has gone on long enough, so it’s probably time just to conduct the analysis in the Comments thread. Have fun! Oh, and feel free to post your own quiz questions and responses – and results. This entry was posted in Pottermore and tagged Pottermore, Pottermore Sorting Hat, Ravenclaw, Slytherin, Sorting Hat. Bookmark the permalink. Pottermore: The Death of the Exploding Cauldron? Oh, I am glad I checked in. There be new content here!! Ah, Pottermore Sorting. I still have mine recorded. I had the same first question as you and your husband, and I chose The Great (reasoning – someone great could be any of the other three). My second question was also the same, the garden one. And like you and your husband, I chose the pool. I liked that there was something in its depths (mystery! ), and it also sounded pretty. Hunger, Cold, Loneliness,Boredom, Being Ignored? I chose being ignored. Next I had to choose my preferred superpower. From Read Minds, Invisibility, superhuman strength, speak to animals,change the past, change appearance at will I chose change appearance at will. I’d prefer not to read minds, thank you, invisibility is less flexible than the power I chose, superhuman strength is useful only in limited circumstances and most times can be achieved using Muggle means, I’m not sure animals are that interesting to speak with, and I suspect changing the past would have unintended consequences. Next, I was to imagine that walking alone late at night, I heard a cry I suspected to be of magical origin. I had to choose a course of action – to proceed with caution, keeping one hand on my concealed wand and an eye out for any disturbance, to draw my wand and seek source of noise, to draw my wand and stand my ground, or to withdraw into the shadows to await developments, while mentally reviewing the most appropriate defensive and offensive spells, should trouble occur? I chose the first option. I’ve lived in large cities and walked around them alone late at night in my reckless youth *grin* and so I can confirm that this *is* my actual reaction to this type of circumstance. Not to look for trouble, not to make any obvious defensive reaction, but to seem outwardly unperturbed by events and continue on my way. Finally I had two questions giving me a choice of two things. Moon or Stars? Heads or Tails? I chose Moon and Tails. The first I could have gone either way with. I like the stars, and I like the moon! Perhaps I figured a lot of moonlight would be nice in the previous question…Tails is what I have always picked when flipping a coin, I am not sure why. 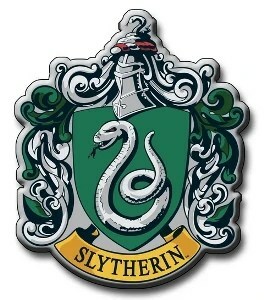 I was Sorted into Slytherin House. I have some feelings about the questions, but not much data to back them. Like the first we all had – Great seems the obviously Slytherin answer, Wise the obviously Ravenclaw one, Bold, Gryffindor, and Good, Hufflepuff. If that’s right, you, CCS, must have given some other pretty Slytherin answer(s) to make up for it. The second one I find hard to match to houses directly, though it did have four answers. I’ve tried, but don’t see connections other than that the pool is water (Slytherin?). I think you and your husband’s answers to the magical creatures question is one where you each picked an answer that helped determine your Houses. 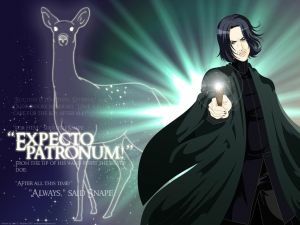 Centaurs in HP are learned, it sounds like a Ravenclaw choise. Merpeople can be seen swimming my our House Common Room windows, so at least if you pick thi one you will enjoy the decor? I find your comment that your husband got a different question after the first time your answers diverged, intriguing. I had the same first question as you, and even though I gave a different answer, I also had the same second question. But starting at the third, I got a rather different series of questions than you (until heads/tails). Hi Z! Interesting Quiz. On your quiz, I probably would have chosen “Cold, “Speak to animals” (or possibly invisibility or shapeshifting), probably “Proceed with caution,” “Stars,” and “Heads.” Who knows where I would have ended up!!! I agree that “Great” seems like the most obviously Slytherin answer on the Great/Good/Wise/Bold question. But I’m not sure that I needed to do a lot of “Slytherin” compensating to overcome the “Ravenclaw-ness” of choosing “The Wise.” After all, our prefect does tell us that our House mascot is the “wisest of creatures.” So wisdom also has Slytherin associations – not to mention that Merlin was quite wise. My guess is that the answer is not overwhelmingly weighted toward Ravenclaw. Hmmm, I did a search for Pottermore and found your blog. I’ve run into an issue trying to get through the game and it seems like you’ve accrued a decent amount of knowledge on the game in general, so maybe you can help? My most recent post is about it (basically I got stuck in Diagon Alley). Any idea what the problem might be? Help > Other > What's next? > Need more help? This will give you a contact form where you can discuss any issue you are having with the site. Finally, if you are unable to get your issue resolved quickly, you may as well delete your account and create a new one. You haven’t gotten your school supplies, bought your pet or your wand, or been sorted yet. So unless you are seriously attached to your username, you would not have anything really to lose by deleting the account that’s not working and creating a new one. I looked back through my sorting quiz and here are my answers. 1. For what I value most: of choices between, Love, Power, Glory and Wisdom…..I chose Wisdom. 2. Given a choice of the scene that attracted me most between a Silver leafed tree, an Old Wizard with twinkling eyes, Fat Toadstools talking, and a Bubbling Pool with something luminous and swishy……I chose the Bubbling Luminous Pool. 4. Which Magical Creatures would I most like to study given a choice between, Centaurs, Goblins, Merpeople, Ghosts, Vampires, Werewolves and Trolls. I immediately eliminated goblins, ghosts and trolls. Then I eliminated centaurs and werewolves. I debated awhile over the choice between Vampires (which I love) before choosing Merpeople (about which I knew little). 5. How would I solve the problem of who would fight with a Troll who blocked my way and that of travel companions? Given choices between 1) Drawing lots, 2) Confusing the troll into letting you pass, 3) Suggest that all three fight the troll without telling him, 4) Volunteer to fight……..I chose Confuse the Troll. 6. Choose between heavenly bodies…..Moon or Stars. I chose Stars. 7. Chose between following a path that went Left and a path that went Right. I chose the path that went Right. 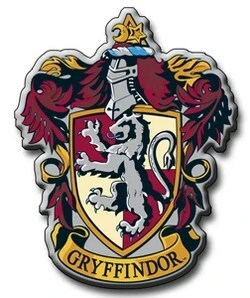 Lo and Behold the Sorting Hat put me in Hufflepuff…..Earth person that I am. hmmm. This is a VERY odd sorting. I do some sorting analysis and according to this quiz you should of been a Ravenclaw or Slytherin. There is not a single Hufflepuff answer here. I wonder if it was some sort of glitch. Wisdom is Ravenclaw, pool is slytherin, that order is a toss up between ravenclaw and slytherin, merepeople is slytherin, and confuse is Ravenclaw. not a single hufflepuff answer. I suspect there was several glitch sortings in beta and thats why the houses were so evenly spread out. im afraid to say this was one of them. Okay, as we all know (or should know), JKR associated the Houses with the Four Elements (Gryffindor = Fire, Hufflepuff = Earth, Ravenclaw = Air, and Slytherin = Water). My theory is that the test focuses extensively on answers corresponding to the Four Elements. These answers can either directly reference the elements or focus on attributes associated with them. For example, Water can be either the literal element of Water or the attributes associated with the element of Water – such as mystery, intuition, creativity, etc. This is one way of getting past conscious House associations (because conscious associations would enable test-takers to trick the test and get placed pretty much anywhere they want). By bypassing conscious associations, the test would focus more on unconscious attributes that are associated with the Houses by way of the Elements. I personally think it’s a clever test… not overly rigged (except to the extent that it attempts to quarter the students) and definitely not just random. I knew before I hit the final submit button that my “water” answers made it highly likely I would end up in Slytherin… just as my husband’s “air” answers made it highly likely he would end up in Ravenclaw. Here is Mary’s sorting quiz. Although the questions are not identical, they bear a lot of resemblance to mine. 3. For the Troll on the loose question, she chose the same order as I did. 1. Merlin’s book, 2. The cure, and 3. Student records. 7. Heads or Tails. She chose Tails. This quiz put Mary in Ravenclaw. There it is. I was reasonably certain she would be sorted into Ravenclaw, and she was. Question 1- Given the choice would you rather invent a potion that would garantee you…I had to choose between Love, Glory, Wisdom, and Power. I dont need Love and that would feel like i was manipulating someone. Not Power. I have no need for Power. Not Wisdom…again i feel like i have no use for that..so i went with Glory because i am very competitive. Question 2- You enter an enchanted Garden. which would you the most curious to examine first…I had to choose between a silver tree with golden apples, Talking toadstools, A luminous pool, and A statue of a wizard with a twinkling eye. With out a doubt i had to go with the pool. Its luminous, bubbling, and mysterious. Question 3- Wich would you rather be…There were variouse options i dont remeber but i debated on being Praised and Liked. I went with liked because i would bother me more to not be liked than not to be praised. Question 4- Which super power would you have given the choice…Again various answers from talking to animals, to reading minds. I went with to change the past. Because that would be the most usefull for me. Question 7- Left or Right…Went with left. Always do. 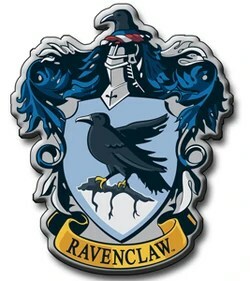 I got to be a rare(r) Ravenclaw! For my sorting quiz these are the questions I got asked. I chose, WISDOM. I like being wise and clever over things like power, or love. Smart is awesome! 2. You enter an enchanted garden. What would you be most curious to examine first? I chose the pool, since I like swimming, but I considered the tree with golden apples. 3. Which would you rather be? I chose imitated because I am used to setting examples and I LOVE being imitated. 4. Which road tempts you most? I chose the cobbled street with ancient buildings because I just love building and I couldn’t think of the fun it would be to see the buildings, though I considered the forest. 5. Which nightmare would frighten you most? I chose having to speak is a silly voice because it would be horrible for people not to understand you. Tails because I always get tails when I flip coins and I might as well take tails. I got Ravenclaw, and I’m happy with it!